You've noticed that phishing is ubiquitous now. Like the Nigerian 411 scam it seems to pervade every aspect of our personal and professional online life. By some accounts, losses due to phish scams exceed $1billion and affect millions of victims. Have you ever wondered why this is so? I'll explain some of these phish phactors below. One thing that accounts for phishing's persistence despite universal investigation by IT security organizations and law enforcement is that it is a blend of three elements, each of which relates to a different aspect of human experience: technical subterfuge, perception management and social engineering. Phishing shares the technical subterfuge dimension with hacking and computer viruses. It shares perception management with credit card skimming, 3 card monte and a host of confidence games. It shares social engineering with gaining illegal entry to a secure facility by “tailgaiting” behind a legal access or finding passwords taped to the bottom of desk drawers. The fact that phishing is three-dimensional makes it hard to defeat because the exploit is a simultaneous attack against our technical understanding, our general propensity to believe what we see, and our conviction that we can't be fooled easily. Phishing is literally “triple-threat” cybercrime. A more-or-less typical fishing exploit appears in Figure 1. 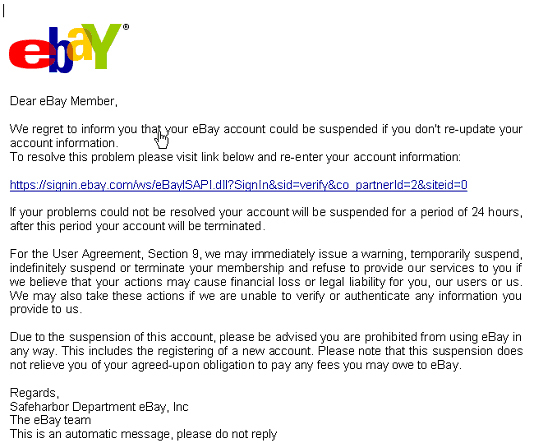 In this case the Phish is an email (technical subterfuge) with an apparent invitation by an online auction house to update account information (perception management). The victim is enticed to do so because it is natural to want to ensure that one's personal accounts are accurate (social engineering). Of course this is only a partial list, but it illustrates the variety of phishing attacks that are in circulation – each category of which exploits a different weakness in our technical understanding of the way Internet services work. This isn't rocket science, but one must admit that it's clever. The fact of the matter is that the designers of Internet Explorer never anticipated anyone entering an escape sequence in a URL, so it didn't look for it – to it's users cost. Here the technical subterfuge not only took in users but also software designers. This is a simple example of script embedding. A similar situation arises with URL or Domain spoofing Let's investigate how we might play with a URL in such a way that the unsuspecting user wouldn't notice. There are three basic cases to consider: where we add, substitute, or delete some elements that makes the URL in the Phish email subtly different that the correct URL. Consider the following three cases. Note that the domain tail of the first fake URL is “validation.co.uk” – that's the domain that appears in the Internet domain registry. Obviously this doesn't have anything to do with Barklayze bank. In the second fake, the subtle difference is the substation of a one for an “L” – they look the same in the browser window, but the link is very different. The domain in this case is some “A-O-One” not AOL as we would have guessed. I haven't seen an example of deletion in the wild yet, but you can rest assured that it's out there someplace. Let's return to our original example for a deeper analysis. We'll call this a “phish phillet.” (sorry, but I've been waiting a long time for the right moment to use this phrase.”) In any case, the way to develop skill in this area is to click on “view source” in your mailer. If you use a basic Pop-3 or IMAP mailer like Eudora this is simpler. Some more sophisticated mailers like Notes will suppress scripts, MIME inclusions, etc. and may make the analysis harder. Look at this closely. The first thing that comes to mind is that there is one humongous image map in this email that is 646 by 569 elements in size. One can confirm that this is essentially the entire email. So what appears as a logo and text, is actually a graphic. This is like mailing a photograph of a letter to someone. This alone should raise a red flag. Second, even if we allow that an image map might be useful, “ xlhjiwb" is an exceedingly strange name for it. It violates the principle of programming mnemonics whereby you name files and variables in such a way that it's use is easiest for another programmer to understand. Flag #2. There's one more cue that something is awry. See if you can find it. Although these have been around long enough that few still fall for them, they were very effective when first launched. The variations on these themes are limited only by the cybercrook's imagination. it will do 1.-4. quickly enough that the victim will not have a chance to reflect on his/her decision until it's too late. So, that's what you have to look for. Good phishing! b.t.w., the last cue is the appearance and location of the cursor. Note that the hand betrays that it's an active link, though it's not even close to the presumed anchor in the email. That suggests that the real anchor is actually the entire email. Hal Berghel is (among other things) Director of the Center for CyberSecurity Research (ccr.i2.nscee.edu) and Co-Director of the Identity Theft and Financial Fraud Research and Operations Center ( www.itffroc.org ). He also owns a security consultancy, Berghel.Net.